Since 1980, the number of people in U.S. prisons has increased more than 450%. 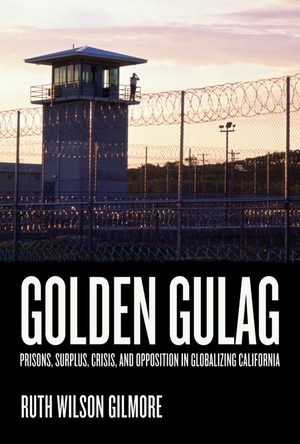 Despite a crime rate that has been falling steadily for decades, California has led the way in this explosion, with what a state analyst called “the biggest prison building project in the history of the world.” Golden Gulag provides the first detailed explanation for that buildup by looking at how political and economic forces, ranging from global to local, conjoined to produce the prison boom. In an informed and impassioned account, Ruth Wilson Gilmore examines this issue through statewide, rural, and urban perspectives to explain how the expansion developed from surpluses of finance capital, labor, land, and state capacity. Detailing crises that hit California’s economy with particular ferocity, she argues that defeats of radical struggles, weakening of labor, and shifting patterns of capital investment have been key conditions for prison growth. The results—a vast and expensive prison system, a huge number of incarcerated young people of color, and the increase in punitive justice such as the “three strikes” law—pose profound and troubling questions for the future of California, the United States, and the world. Golden Gulag provides a rich context for this complex dilemma, and at the same time challenges many cherished assumptions about who benefits and who suffers from the state’s commitment to prison expansion. Ruth Wilson Gilmore is Associate Professor of Geography and Director of the Program in American Studies and Ethnicity at the University of Southern California. She is a member of the founding collective of Critical Resistance, one of the most important national anti-prison organizations in the United States.